I, hereby publicly declare my Muslim and Arab/Berber heritage. (3) descendants of the Gaelic Mórdha clan. My lineage is from the first of these. With that accomplished, I protest in the most vigorous terms attempts, by any local, state or federal government in the United States, to “register” us, or otherwise set us apart in legislation or executive decree as a potential threat or risk to the United States of America. I further protest in the most vigorous terms any effort to register any other group of people based on heritage, religion, genetic information, or whatever other classifications may be devised to deprive groups of people of their inalienable rights as defined in the US Bill of Rights, the Declaration des Droits de l’Homme et du Citoyen, and the International Bill of Rights. PS: If you have read previous posts in which I discuss my Puritan / Mayflower / Plymouth Colony heritage and thinking “Wait a minute…,” that’s on my mother’s side. My surname comes from my dad’s side. This whole heritage thing is, of course, silly in the sense that virtually all human beings are descended from Africans. But when governments begin to distribute status, rights and privileges in accord with it, it is not longer silly. 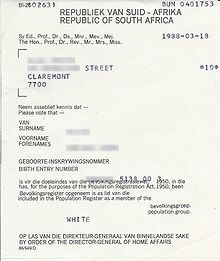 Consult, for example, South Africa’s Population Registration Act, 1950. Moore Name Meaning English: from Old French more ‘Moor’ (Latin maurus). The Latin term denoted a native of northwestern Africa, but in medieval England the word came to be used informally as a nickname for any swarthy or dark-skinned person. English: from a personal name (Latin Maurus ‘Moor’). This name was borne by various early Christian saints. The personal name was introduced to England by the Normans, but it was never as popular in England as it was on the Continent. English: from Middle English more ‘moor’, ‘marsh’, ‘fen’, ‘area of uncultivated land’ (Old English mor), hence a topographic name for someone who lived in such a place or a habitational name from any of the various places named with this word, as for example Moore in Cheshire or More in Shropshire. Irish: Anglicized form of Gaelic Ó Mórdha ‘descendant of Mórdha’, a byname meaning ‘great’, ‘proud’, or ‘stately’. This entry was posted in Uncategorized and tagged #MuslimRegistration. Bookmark the permalink.